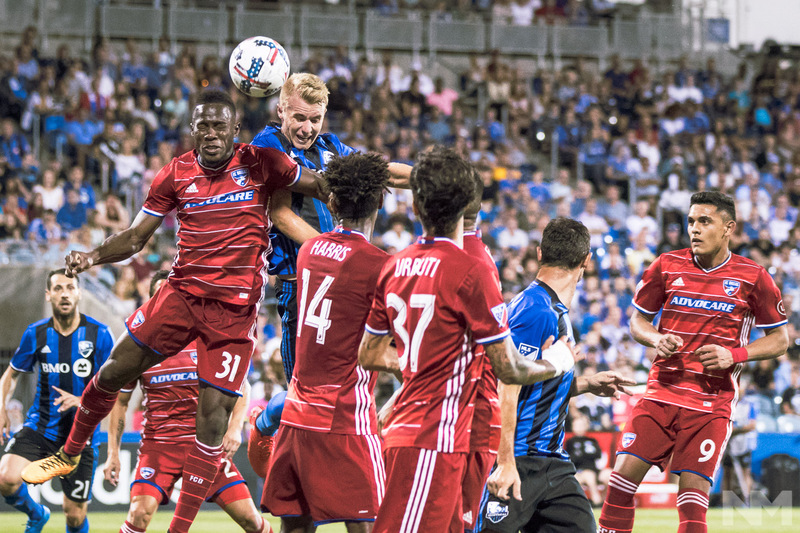 FC Dallas defender Maynor Figueroa (31) and Montreal Impact defender Kyle Fisher (26) jump for the ball during the MLS 2017 season match between the Montreal Impact and FC Dallas, on July 22 2017, at Stade Saputo, in Montreal, Quebec, Canada. (Photo: Pablo A. Ortiz / NM Noticias). 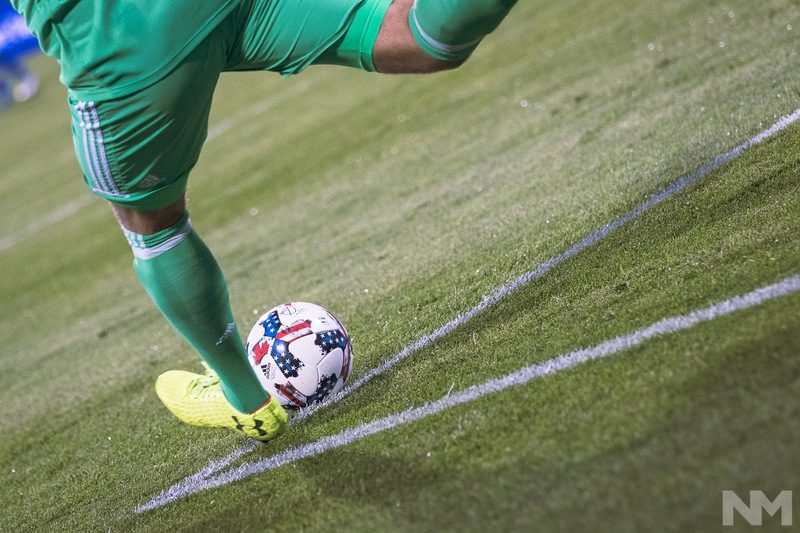 Hay una razón por la que el FC Dallas es considerado uno de los mejores equipos en la actualidad en la MLS. 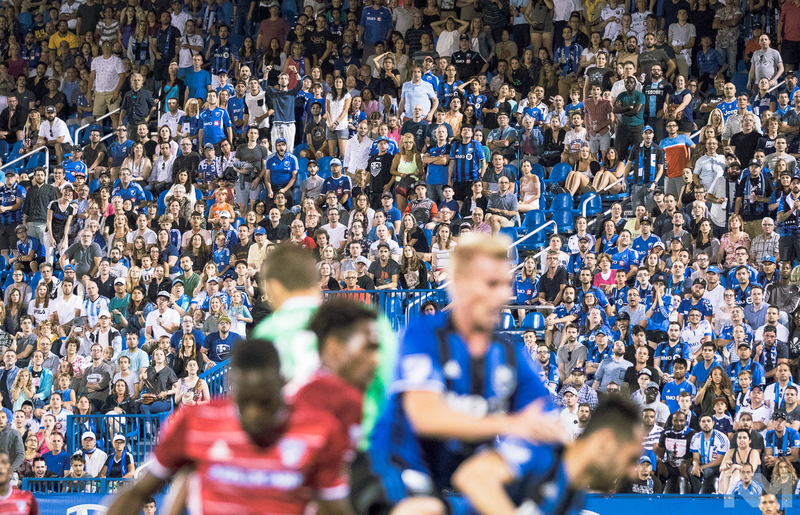 Así lo demostró este sábado en el Stade Saputo de Montreal. El club estadounidense se despertó en el momento oportuno, y junto a una parsimonia que se apoderó de los locales, permitió a la visita remontar un partido trancado y llevarse la victoria 2-1. El Impact, que quería mantener el buen ritmo jugando de local, vuelve a verse como un club frágil, falto de ideas por momentos. 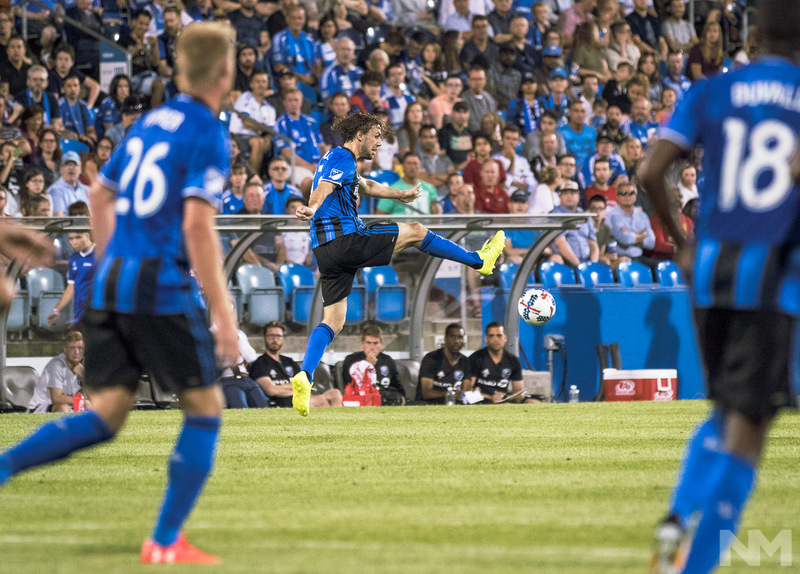 Montreal se había puesto adelante con un cabezazo de Michael Salazar, su tercer gol en igual número de partidos. Sin embargo, en la segunda mitad todo se vino abajo. El paraguayo Cristian Colman marco los dos goles de la remontada, con 10 minutos de diferencia, para darle los tres puntos a Dallas. 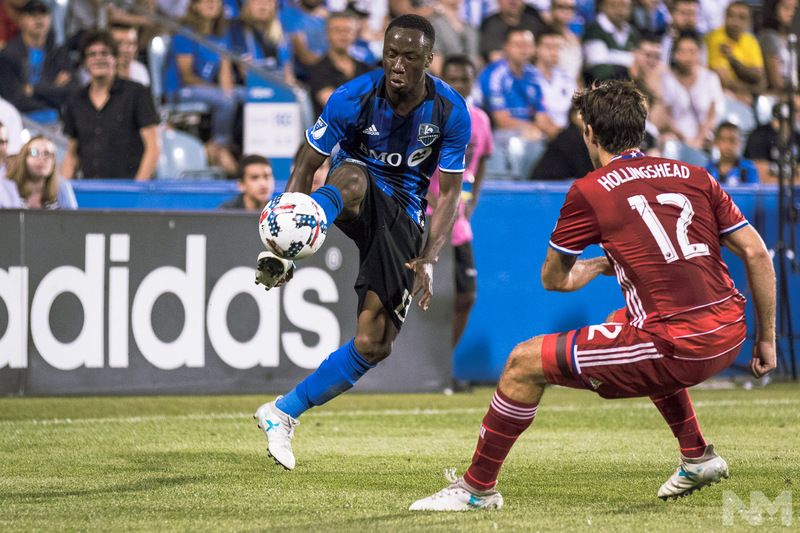 El Impact visitará la próxima semana a los New York Red Bulls y volverá en dos semanas al Stade Saputo para enfrentar al Orlando City de Kaká. 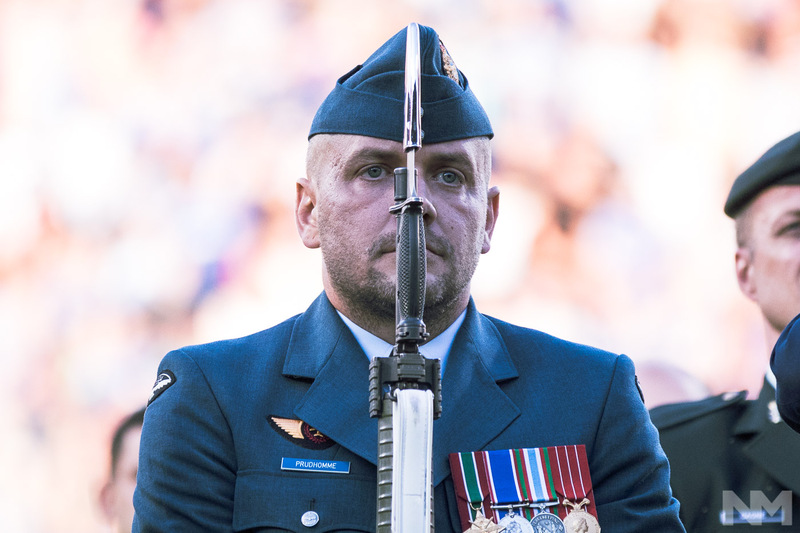 The pregame ceremony before the MLS 2017 season match between the Montreal Impact and FC Dallas, on July 22 2017, at Stade Saputo, in Montreal, Quebec, Canada. (Photo: Pablo A. Ortiz / NM Noticias). 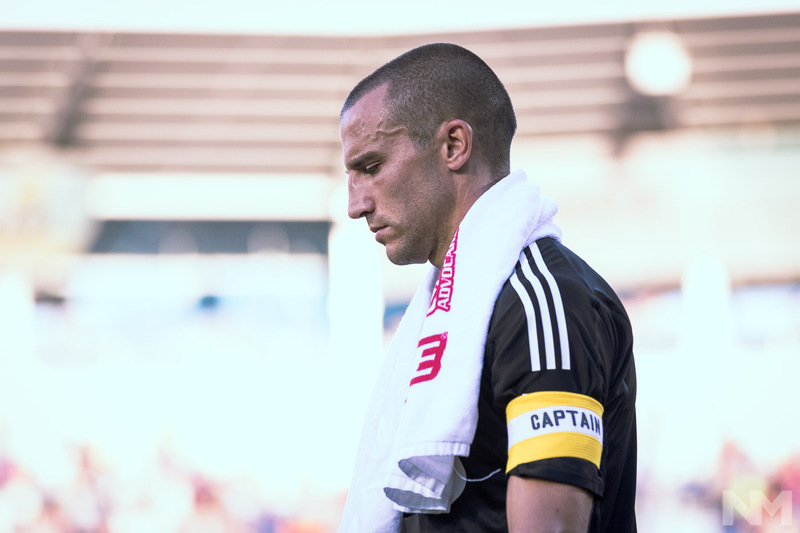 Montreal Impact goalkeeper Evan Bush (1) during the MLS 2017 season match between the Montreal Impact and FC Dallas, on July 22 2017, at Stade Saputo, in Montreal, Quebec, Canada. (Photo: Pablo A. Ortiz / NM Noticias). 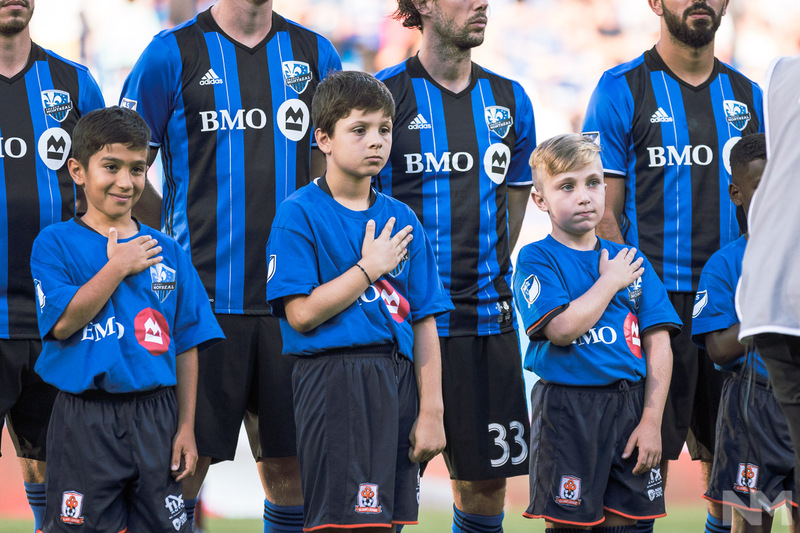 Kids singing the Canadian national anthem during the MLS 2017 season match between the Montreal Impact and FC Dallas, on July 22 2017, at Stade Saputo, in Montreal, Quebec, Canada. (Photo: Pablo A. Ortiz / NM Noticias). 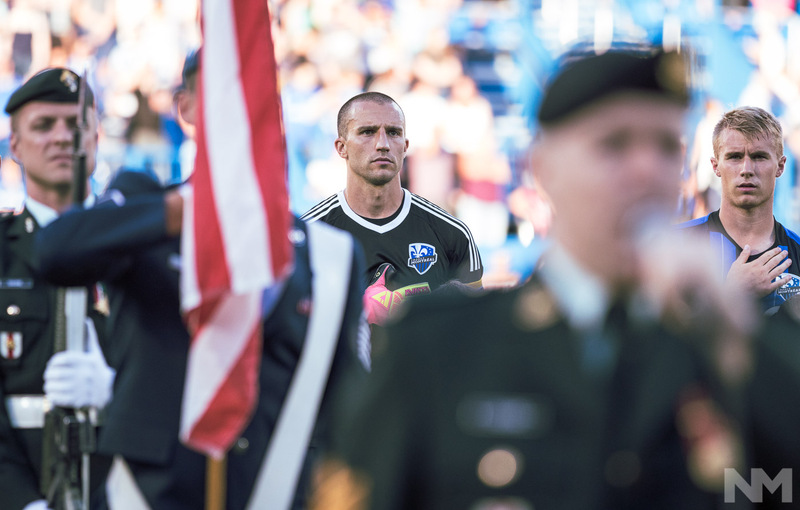 A Canadian Forces officer during the MLS 2017 season match between the Montreal Impact and FC Dallas, on July 22 2017, at Stade Saputo, in Montreal, Quebec, Canada. (Photo: Pablo A. Ortiz / NM Noticias). 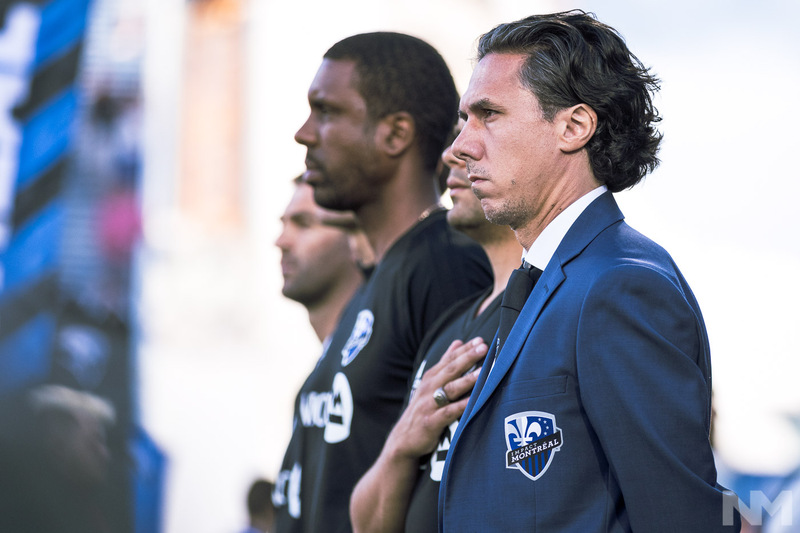 Montreal Impact head coach Mauro Biello during the MLS 2017 season match between the Montreal Impact and FC Dallas, on July 22 2017, at Stade Saputo, in Montreal, Quebec, Canada. (Photo: Pablo A. Ortiz / NM Noticias). 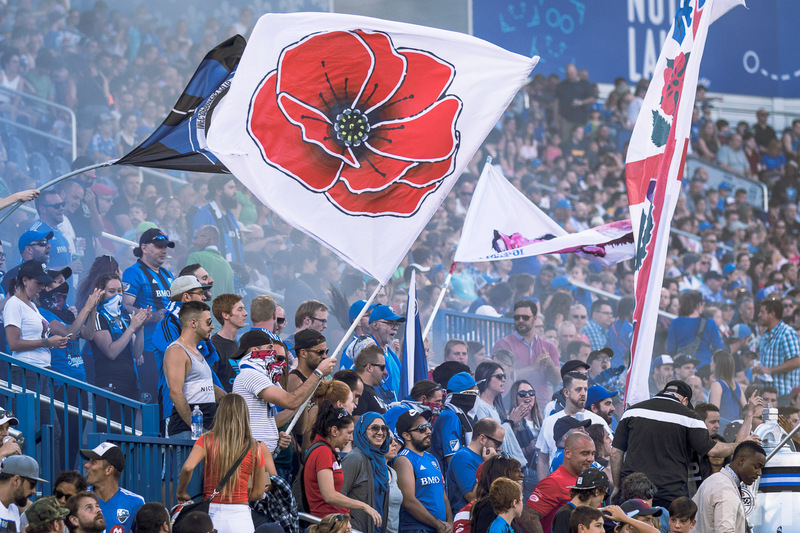 Fans flying banners during the MLS 2017 season match between the Montreal Impact and FC Dallas, on July 22 2017, at Stade Saputo, in Montreal, Quebec, Canada. (Photo: Pablo A. Ortiz / NM Noticias). 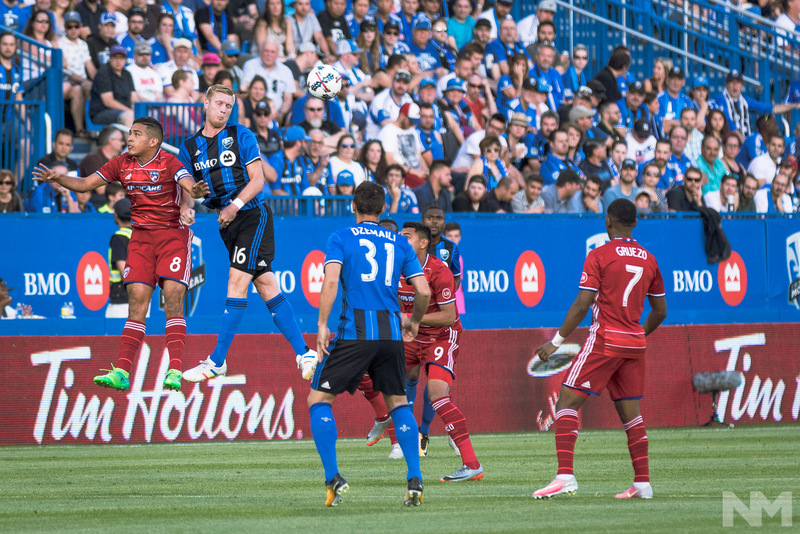 FC Dallas midfielder Víctor Ulloa (8) and Montreal Impact midfielder Calum Mallace (16) jump for the ball during the MLS 2017 season match between the Montreal Impact and FC Dallas, on July 22 2017, at Stade Saputo, in Montreal, Quebec, Canada. (Photo: Pablo A. Ortiz / NM Noticias). 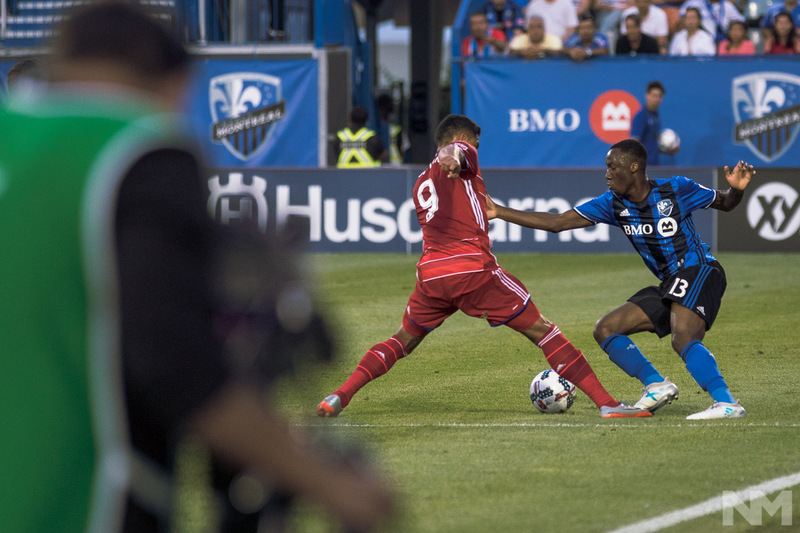 Montreal Impact midfielder Ballou Jean-Yves Tabla (13) fights for the ball during the MLS 2017 season match between the Montreal Impact and FC Dallas, on July 22 2017, at Stade Saputo, in Montreal, Quebec, Canada. (Photo: Pablo A. Ortiz / NM Noticias). Montreal Impact forward Michael Salazar (19) and FC Dallas midfielder Carlos Gruezo (7) fight for the ball during the MLS 2017 season match between the Montreal Impact and FC Dallas, on July 22 2017, at Stade Saputo, in Montreal, Quebec, Canada. (Photo: Pablo A. Ortiz / NM Noticias). 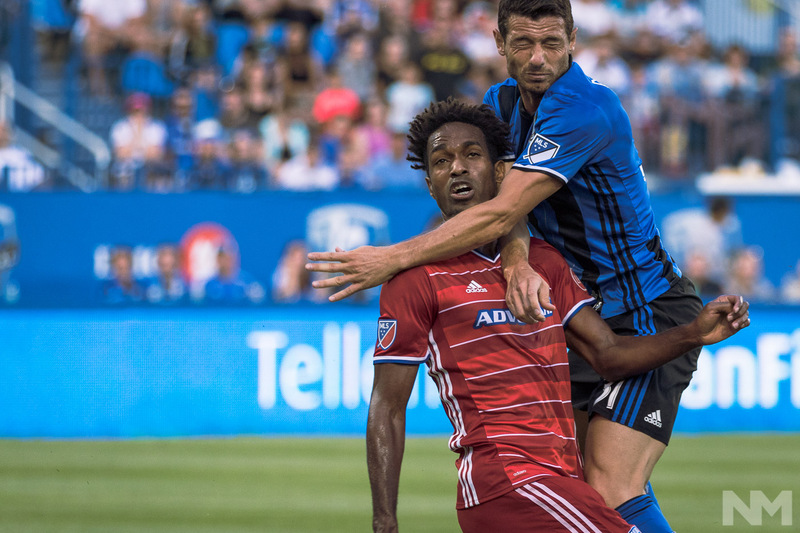 FC Dallas defender Atiba Harris (14) and Montreal Impact midfielder Blerim Dzemaili (31) clash during the MLS 2017 season match between the Montreal Impact and FC Dallas, on July 22 2017, at Stade Saputo, in Montreal, Quebec, Canada. (Photo: Pablo A. Ortiz / NM Noticias). 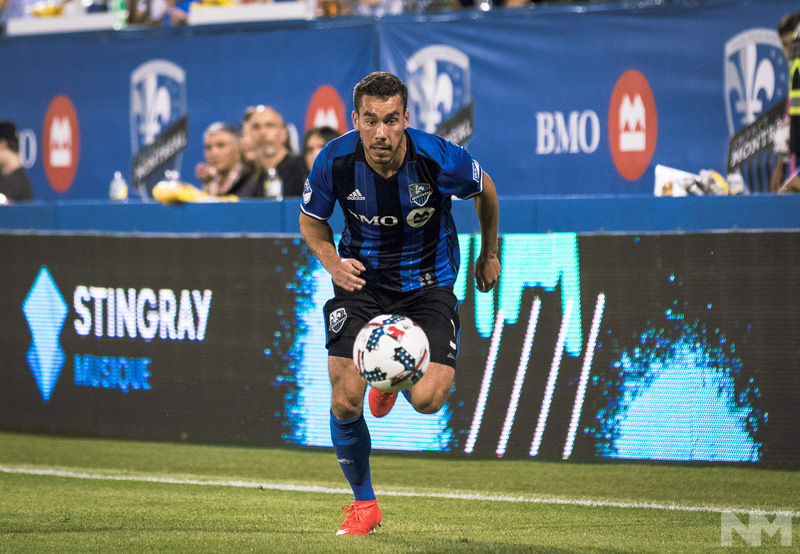 Montreal Impact forward Michael Salazar (19) heads the ball during the MLS 2017 season match between the Montreal Impact and FC Dallas, on July 22 2017, at Stade Saputo, in Montreal, Quebec, Canada. (Photo: Pablo A. Ortiz / NM Noticias). 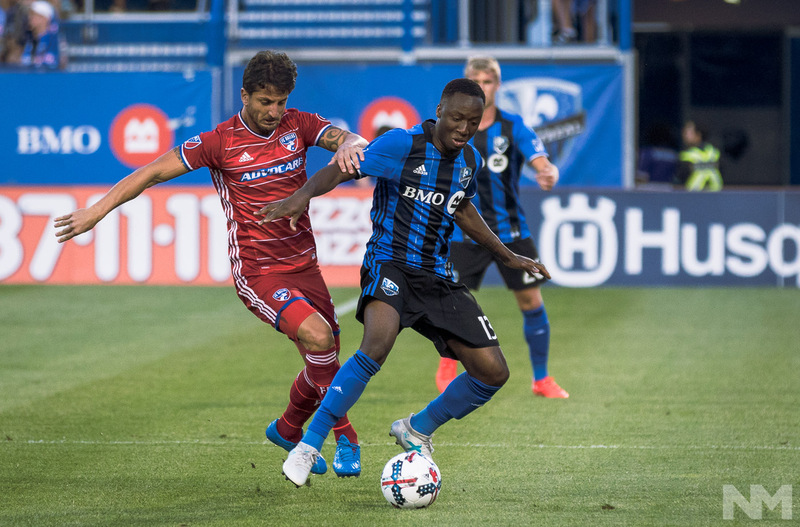 FC Dallas forward Cristian Colman (9) keeps the ball away from Montreal Impact midfielder Ballou Jean-Yves Tabla (13) during the MLS 2017 season match between the Montreal Impact and FC Dallas, on July 22 2017, at Stade Saputo, in Montreal, Quebec, Canada. (Photo: Pablo A. Ortiz / NM Noticias). 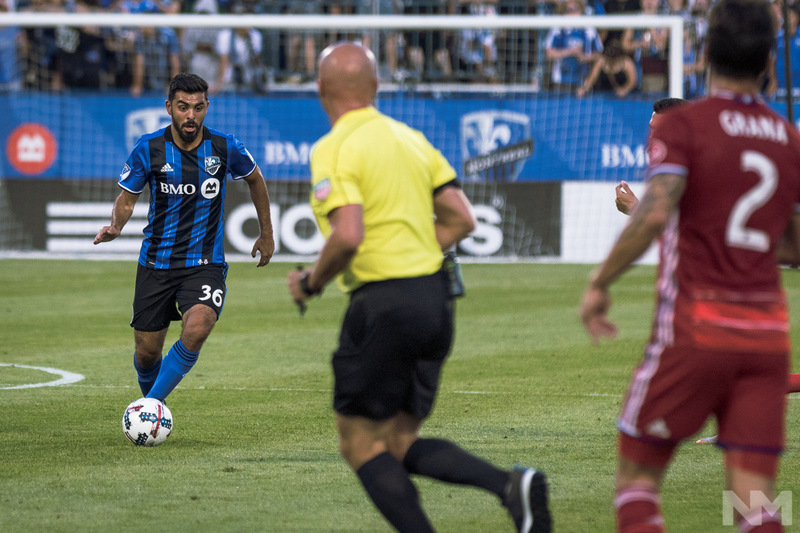 Montreal Impact defender Víctor Cabrera (36) moves with the ball during the MLS 2017 season match between the Montreal Impact and FC Dallas, on July 22 2017, at Stade Saputo, in Montreal, Quebec, Canada. (Photo: Pablo A. Ortiz / NM Noticias). 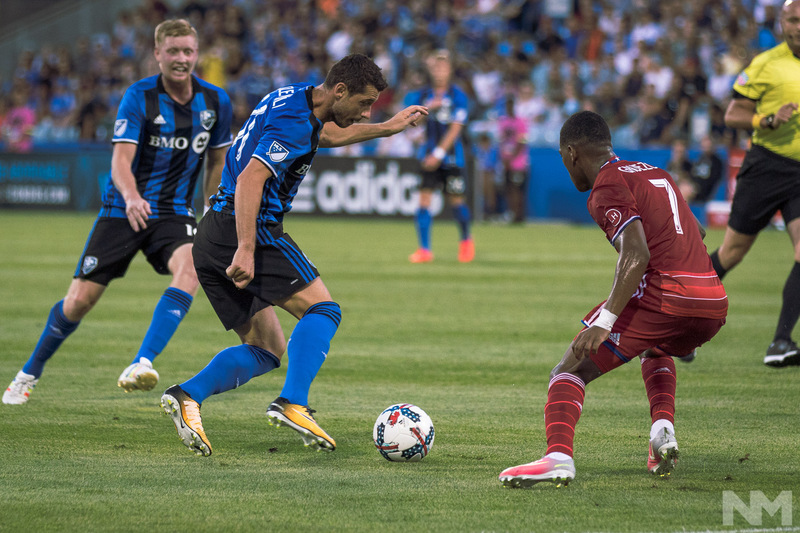 Montreal Impact midfielder Blerim Dzemaili (31) controls the ball during the MLS 2017 season match between the Montreal Impact and FC Dallas, on July 22 2017, at Stade Saputo, in Montreal, Quebec, Canada. (Photo: Pablo A. Ortiz / NM Noticias). 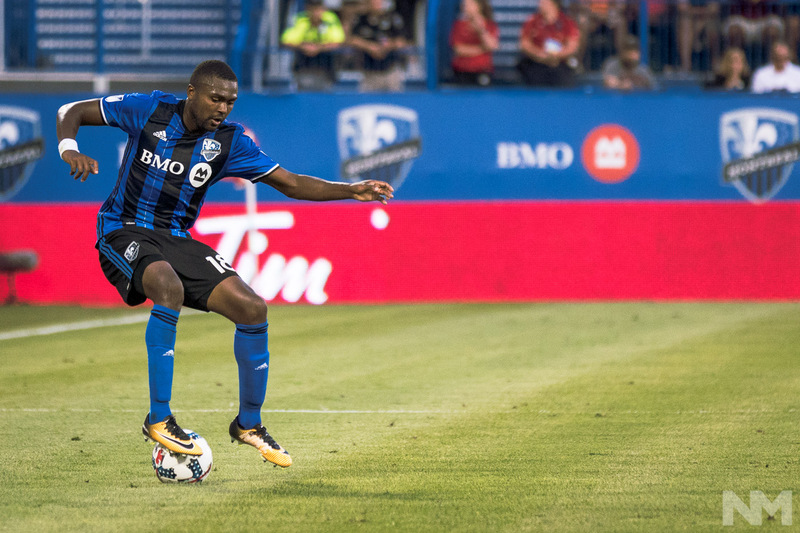 Montreal Impact defender Chris Duvall (18) steps on the ball during the MLS 2017 season match between the Montreal Impact and FC Dallas, on July 22 2017, at Stade Saputo, in Montreal, Quebec, Canada. (Photo: Pablo A. Ortiz / NM Noticias). 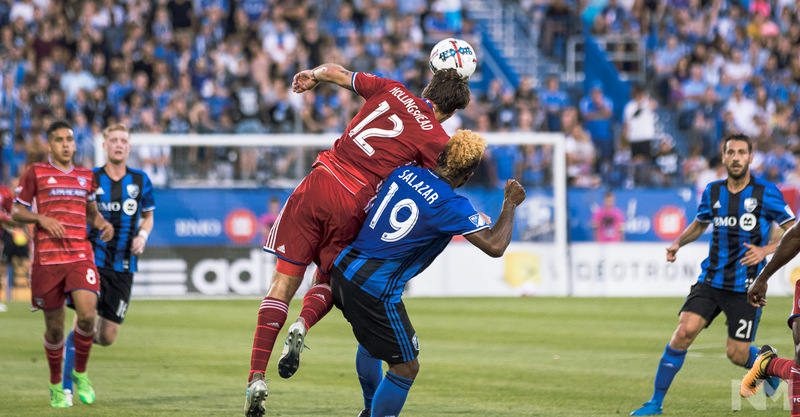 FC Dallas midfielder Ryan Hollingshead (12) and Montreal Impact forward Michael Salazar (19) jump for the ball during the MLS 2017 season match between the Montreal Impact and FC Dallas, on July 22 2017, at Stade Saputo, in Montreal, Quebec, Canada. (Photo: Pablo A. Ortiz / NM Noticias). 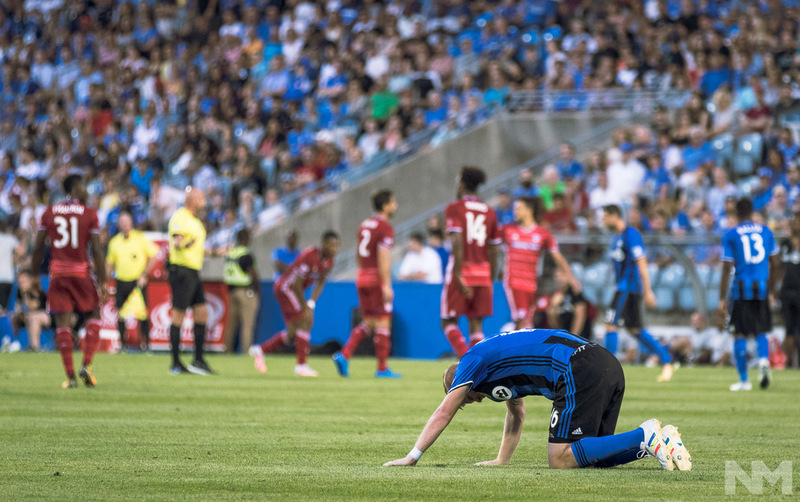 Montreal Impact midfielder Calum Mallace (16) kneels on the field during the MLS 2017 season match between the Montreal Impact and FC Dallas, on July 22 2017, at Stade Saputo, in Montreal, Quebec, Canada. (Photo: Pablo A. Ortiz / NM Noticias). FC Dallas goalkeeper Chris Seitz (18) clears the ball during the MLS 2017 season match between the Montreal Impact and FC Dallas, on July 22 2017, at Stade Saputo, in Montreal, Quebec, Canada. (Photo: Pablo A. Ortiz / NM Noticias). 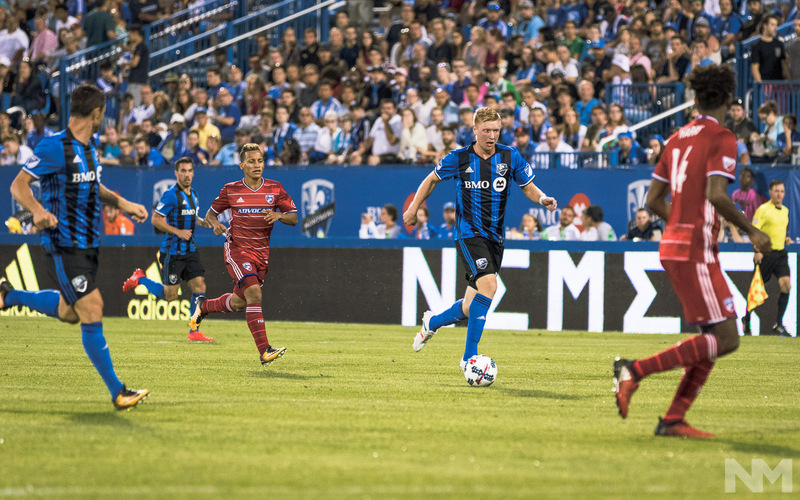 Montreal Impact midfielder Calum Mallace (16) moves with the ball during the MLS 2017 season match between the Montreal Impact and FC Dallas, on July 22 2017, at Stade Saputo, in Montreal, Quebec, Canada. (Photo: Pablo A. Ortiz / NM Noticias). 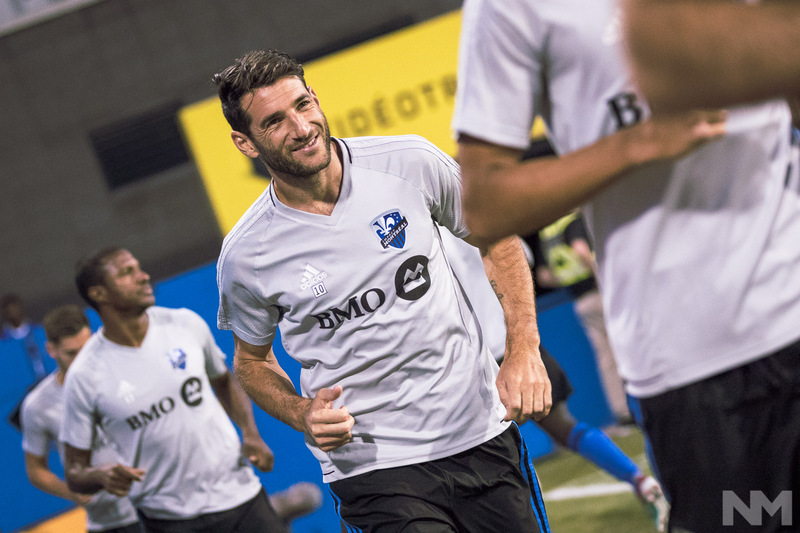 Montreal Impact midfielder Ignacio Piatti (10) warms up during the MLS 2017 season match between the Montreal Impact and FC Dallas, on July 22 2017, at Stade Saputo, in Montreal, Quebec, Canada. (Photo: Pablo A. Ortiz / NM Noticias). 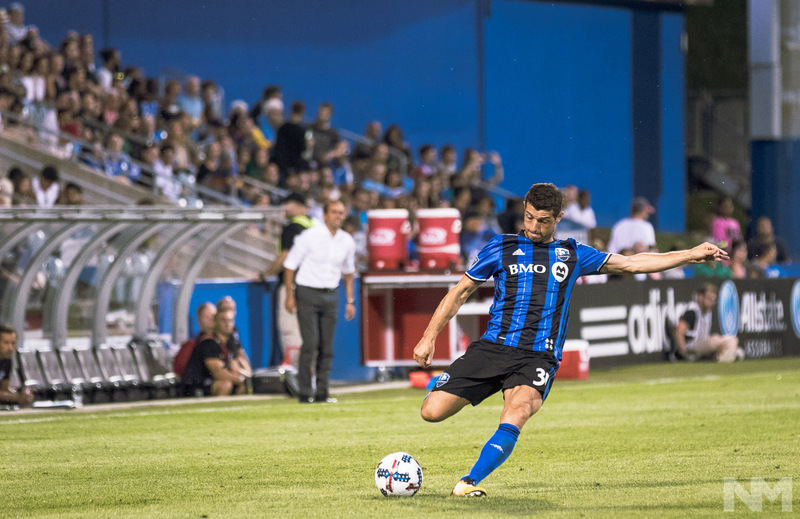 Montreal Impact midfielder Blerim Dzemaili (31) kicks the ball during the MLS 2017 season match between the Montreal Impact and FC Dallas, on July 22 2017, at Stade Saputo, in Montreal, Quebec, Canada. (Photo: Pablo A. Ortiz / NM Noticias). 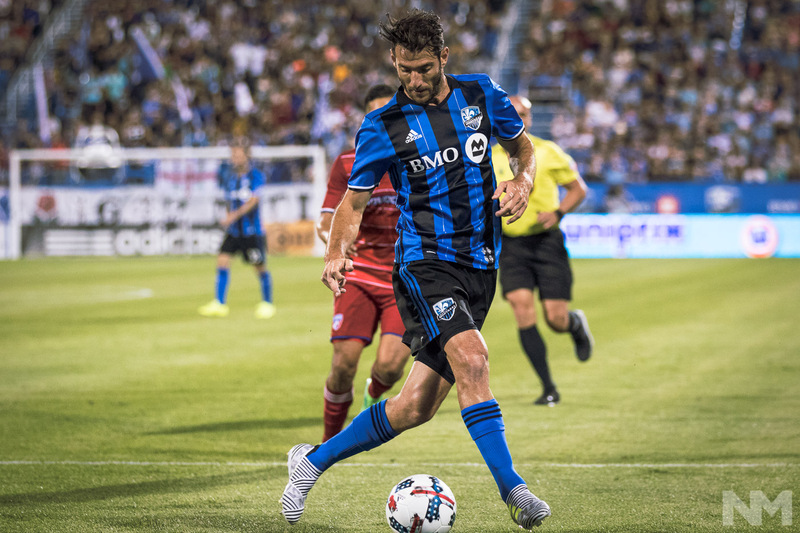 Montreal Impact midfielder Marco Donadel (33) reaches for the ball during the MLS 2017 season match between the Montreal Impact and FC Dallas, on July 22 2017, at Stade Saputo, in Montreal, Quebec, Canada. (Photo: Pablo A. Ortiz / NM Noticias). 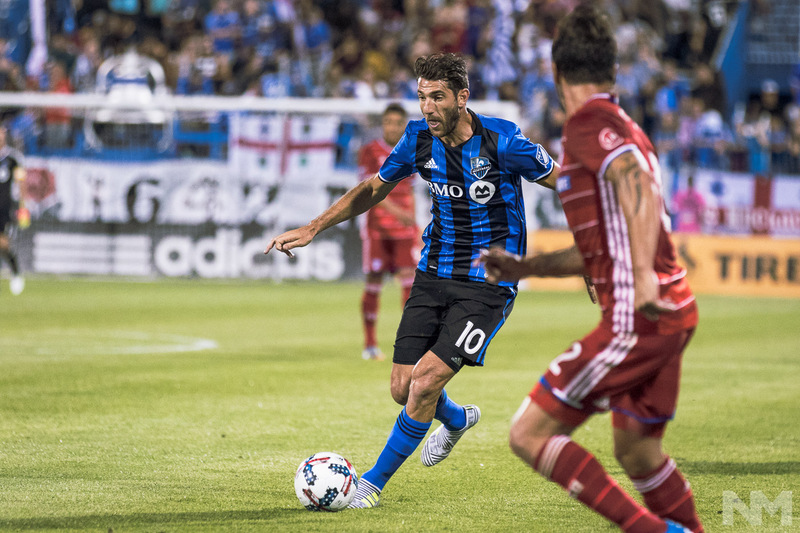 Montreal Impact midfielder Ignacio Piatti (10) runs after the ball during the MLS 2017 season match between the Montreal Impact and FC Dallas, on July 22 2017, at Stade Saputo, in Montreal, Quebec, Canada. (Photo: Pablo A. Ortiz / NM Noticias). Montreal Impact defender Daniel Lovitz (3) runs after the ball during the MLS 2017 season match between the Montreal Impact and FC Dallas, on July 22 2017, at Stade Saputo, in Montreal, Quebec, Canada. (Photo: Pablo A. Ortiz / NM Noticias). 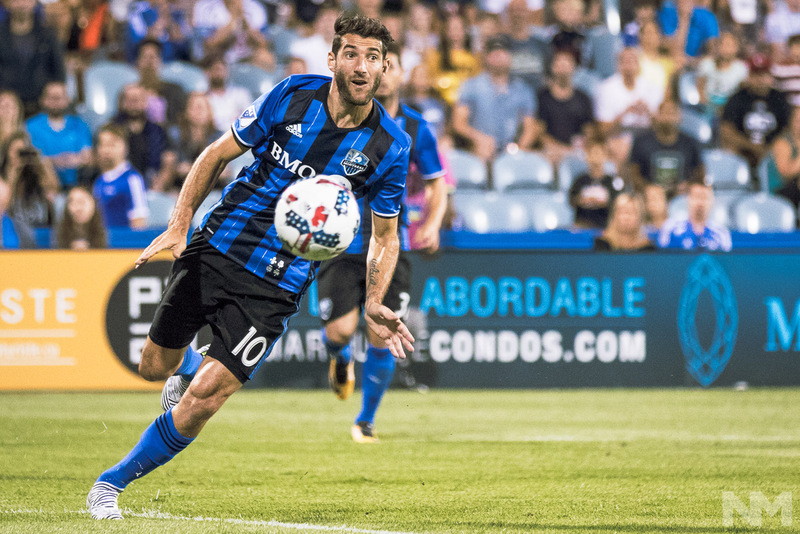 Montreal Impact midfielder Ignacio Piatti (10) moves with the ball during the MLS 2017 season match between the Montreal Impact and FC Dallas, on July 22 2017, at Stade Saputo, in Montreal, Quebec, Canada. (Photo: Pablo A. Ortiz / NM Noticias). 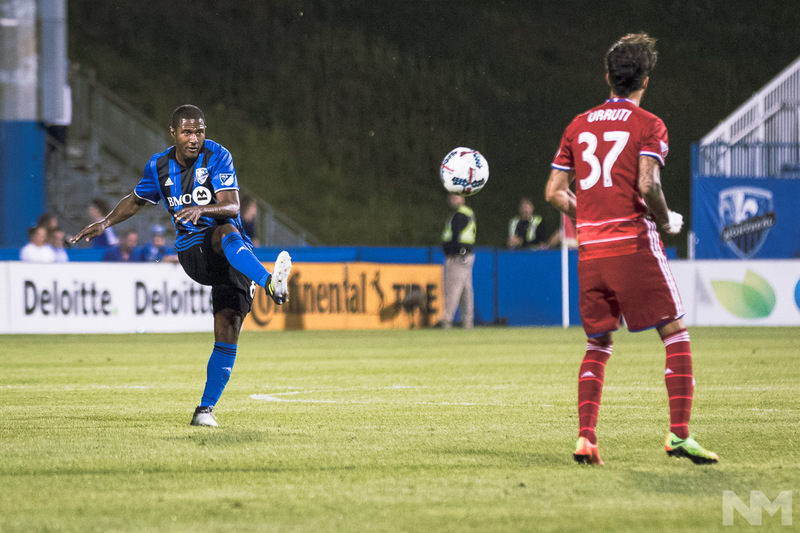 Montreal Impact midfielder Patrice Bernier (8) kicks the ball during the MLS 2017 season match between the Montreal Impact and FC Dallas, on July 22 2017, at Stade Saputo, in Montreal, Quebec, Canada. (Photo: Pablo A. Ortiz / NM Noticias). 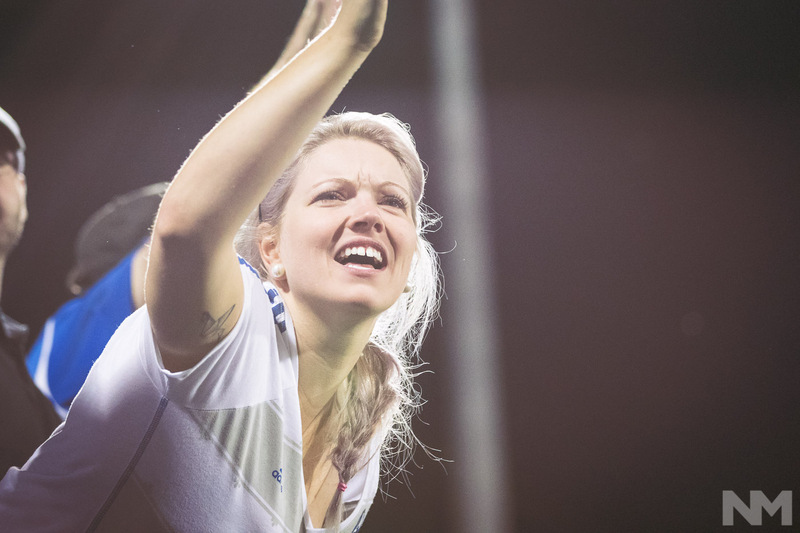 A Montreal fan encourages the team during the MLS 2017 season match between the Montreal Impact and FC Dallas, on July 22 2017, at Stade Saputo, in Montreal, Quebec, Canada. (Photo: Pablo A. Ortiz / NM Noticias). 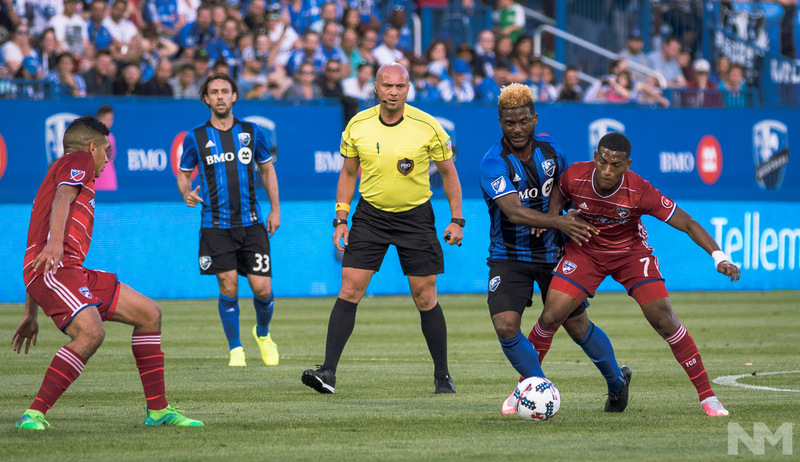 Montreal Impact midfielder Ballou Jean-Yves Tabla (13) controls the ball during the MLS 2017 season match between the Montreal Impact and FC Dallas, on July 22 2017, at Stade Saputo, in Montreal, Quebec, Canada. (Photo: Pablo A. Ortiz / NM Noticias). 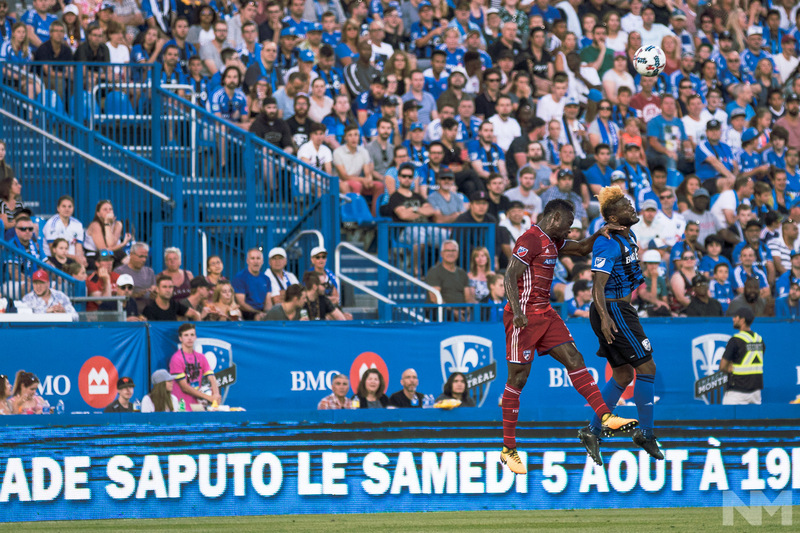 The fans watch a corner kick during the MLS 2017 season match between the Montreal Impact and FC Dallas, on July 22 2017, at Stade Saputo, in Montreal, Quebec, Canada. (Photo: Pablo A. Ortiz / NM Noticias). 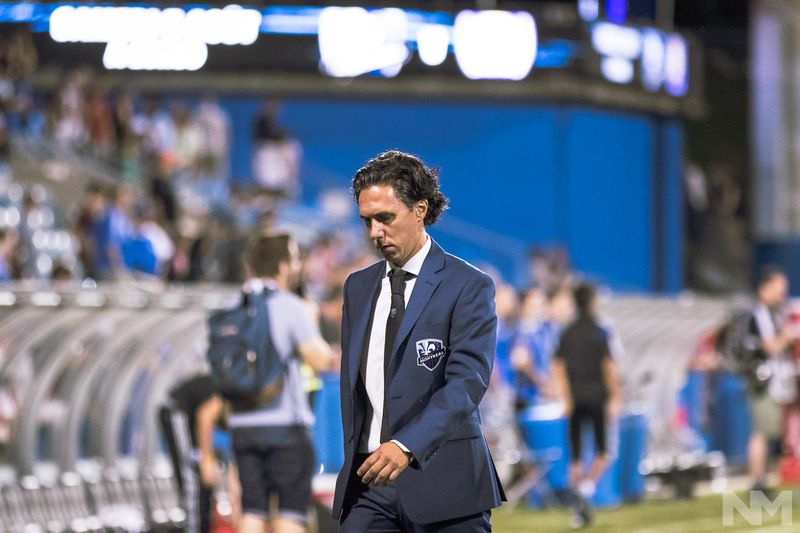 Montreal Impact head coach Mauro Biello leaving the field during the MLS 2017 season match between the Montreal Impact and FC Dallas, on July 22 2017, at Stade Saputo, in Montreal, Quebec, Canada. (Photo: Pablo A. Ortiz / NM Noticias).